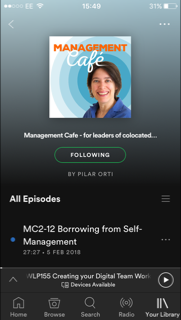 In today's podcast, Pilar talks to Maya Middlemiss about qualitative research, how her virtual team members communicate and how things have changed since she first started working from home 15 years ago. 00:40 Don't miss the next Virtual Team Talk. Sign up here to receive notification of our monthly sessions and links to the recordings. 09:28 Why using video in your meetings is important and what to do if you're restricted to audio. Maya talks about what Saros Research does, a UK-based business with virtual clients and people spread in three countries. "We work around our family life." How her virtual team communicates on Slack. The process of recruiting for qualitative research. Is it still important to have a local base for clients? Working with big and small companies. Christmas Party in Google Hangouts. "I have a very bad habit of getting distracted by the newest shiny app." How work and clients at Saros has changed. "People used to talk about work life balance like they were two different things." Maya's writing a book to help people buy research recruitment, covering the ethics, working with different audiences, etc etc. Based on her own experience. Advocating for participants in medical and medical-related research, speaking at the Consumer Health and Wellbeing Conference. The importance of participants understanding confidentiality. Constant exposure, reaching out - even through podcast sponsorship. Sign up to our monthly dose of recommended reading and listening, as well as digests of our blog posts and podcasts.